Alia Bhatt and Varun Dhawan are ragingly promoting their upcoming period drama Kalank. As the actor duo reached Jalandhar to promote the multi-starrer, they look cute twinning in blue. See in the pictures! One of the most anticipated Hindi films of 2019 is Dharma Productions 'Kalank'. As two lead actors of the film -Alia Bhatt and Varun Dhawan are ragingly promoting their film, they are also flinging some solid fashion goals. 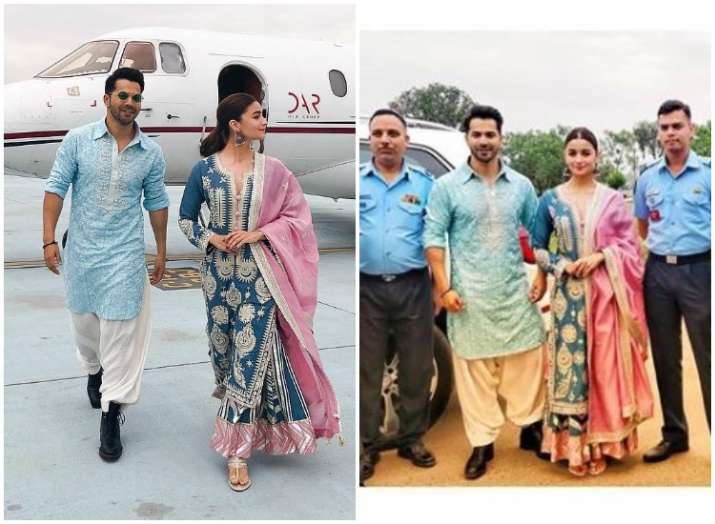 After having a promotional event for Kalank in Jaipur, the actor duo has now landed in Jalandhar. Set in the 1940's, Kalank is a period drama which ensembles actors like Sanjay Dutt, Madhuri Dixit, Varun Dhawan, Alia Bhatt, Sonakshi Sinha, Aditya Roy Kapur, and Kunal Khemmu. The official trailer of the film and songs including Ghar More Pardesiya and First Class are trending on the playlist of the fans. Directed by Abhishek Verman, the film will hot the theatres on 17th April 2019.